Riding the Dartmoor Derby has been a dream three years in the making for me. Some dreams are worth the wait. I finally rode the Dartmoor Derby from September 21-23rd and it lived up to all of the hype and expectations that I had for it. 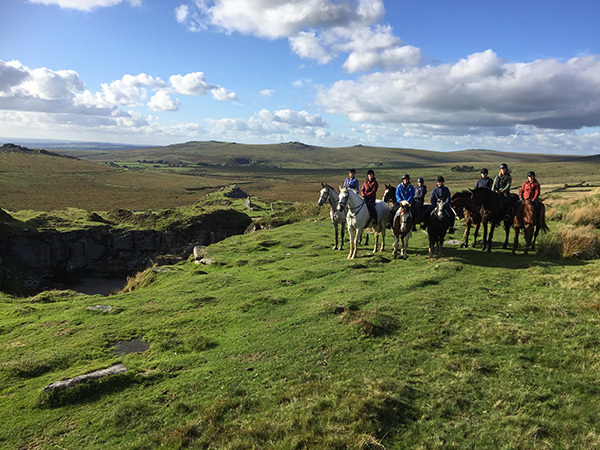 First, a little background; the Dartmoor Derby was founded by Elaine Prior of Liberty Trails and brings the speed, excitement, endurance, and fun of the Mongolian Derby and luxury of an African Safari to the moors of England. 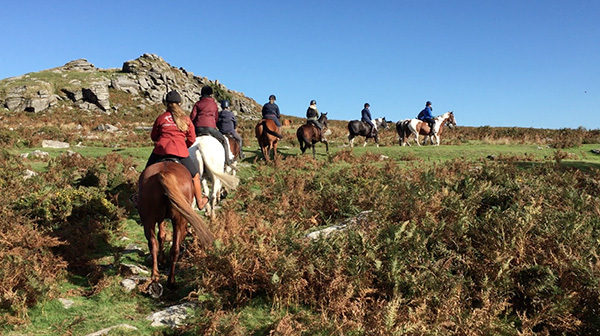 The Derby had a trial run in 2015, and this was the third year Liberty Trails hosted a group of riders on Dartmoor. 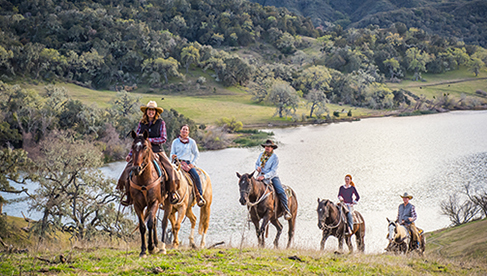 Riders are in groups of eight, and can bring their own horses or hire a hunter-type horse for the ride. We had 22 riders from three different countries this year, forming three different groups. Each group has two local guides, and at least two ground crew members. 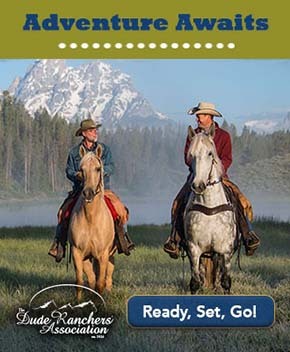 The guides re-ride the Derby routes prior to the event each September. The plan for the Derby is to arrive on Friday and have a short ride to get to know the horses. Then it’s full days of riding on Saturday and Sunday, and departure on Monday morning. 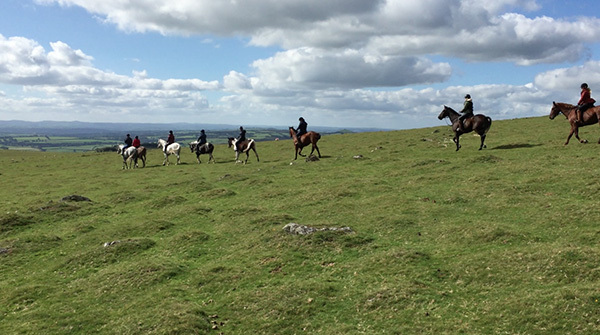 Each year, the Derby is up to 50 miles of riding across Dartmoor. High winds and heavy rain forced some last minute changes to the Derby this year, but the organizers took it all in stride. They switched the short Friday ride to Saturday, and planned a longer distance for Friday, telling us all to wear our rain gear both days. I knew we were riding soon after arrival, so was wearing breeches, boots and half chaps, standing outside the train station in Exeter, England. A woman walked up and asked if I was going to the Dartmoor Derby, she and her three friends (all from London) were also headed there. We chatted as we waited for the ground crew. Jules arrived, followed shortly after by Bob. We were still missing three other riders, so Jules took the four that came together in her vehicle, and Bob and I waited for the other three. Jennifer, BiBi and Jodi arrived (hailing from Tennessee and Alabama respectively). They were so funny and I liked them immediately. We drove the 40 minutes over to Princetown talking the whole way, with Bob filling us in on local information, the sights we were passing, and the Derby. We drove to the barn first. The base camp is at the Dartmoor Prison Farm that is rented out by Neil, a local farmer. We checked in briefly, but needed to drop our luggage and find our helmets, so we drove down to the camp. Camp is in the middle of a field; there are yurts (three people per yurt, in some cases four in a larger yurt for the groups that traveled together), and a dining yurt. Each yurt is named for one of the tors (hills) in Dartmoor. I picked a bed in my yurt, grabbed my helmet and headed back to the Land Rover. We drove up to the barn, were assigned our teams, and given a ribbon to wear with our team color. I was on the orange team, led by Rachel and Lucy. 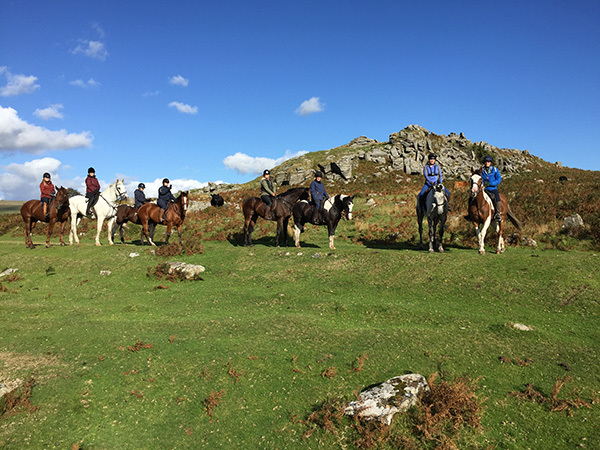 My fellow team members were the four women from London (Heidi, Kim, Emma, and Kristina), my yurt mate Catherine from Cornwall, and Emma from Cotswolds, who was riding her third Dartmoor Derby. My horse for the weekend was Wilma, an Irish Hunter mare owned by a gentleman from one of the local hunts. The wind was blowing and we were off riding. The scenery was stunning. Words and pictures can't truly do it justice; it's something that needs to be experienced in person. Stacey Stearns with Wilma riding in the Dartmoor Derby. Photo by Lucy Higginson. The tallest tor is North Hessary in Princetown and we rode up and down this one each day on our way in and out of camp. It has a cell phone tower on the top, and that helped those of us from away distinguish where we were. From there we rode to Foggintor where we saw one of the three quarries where they excavated stone for the London Bridge. There is a deep pool inside. We rode to Leeden tor, on to black tor, and crossed the river, and continued on to Hart tor and crossed the Hart tor brook. We rode out to another point, Cramber tor, where we could see the Burrator reservoir, and look out in the distance on the Portsmouth bay. Next we headed down to Crazywell pool, it’s 80 feet deep and the British army practices swimming across it with full packs on. We continued heading down towards the Burrator plantation and reservoir. Our group stopped and chatted with the Neil and Paul (the photographer) at Norsworthy Bridge, and then climbed up Sheeps tor, passed what is called the ‘scout hut’ and then stopped at Ditsworthy Warren farmhouse where part of the movie War Horse was filmed and took a group photo. Riding through areas where "War Horse" filmed. Between the ears shot by Stacey Stearns. We stopped at a stone circle and had a big long canter over to the wall of a house that someone had lived in before the Black Death came through and they moved off of the moors. Then we rode to the foundation of a house that someone had lived in to look after the stream where it came out the side of the tor before heading to the sea. It looked like a hobbit house. Rachel grew up and still lives on Dartmoor, and filled us in on all of the history as we stopped at various points throughout the ride. Soon we were watching the grey skies and storm clouds that were forecasted roll over the moors and closer to us as we were coming off Combshead tor. We picked up a brisker pace, and zipped up our rain jackets. Wilma loves to lead, and we trotted down a gravel path, back toward camp, as the hail pelted us on our way to South Hessary. Before long we were back at the barn, the having ridden 20-22 miles. The ground crew sprang into action taking our horses, and we were given hot cups of tea. We headed back to our yurts, showered and changed. The yurts all have heaters, lamps, a small potted rose plant, carpets, are decorated with beautiful wall hangings of different patterns, and have a skylight at the top. At the dining yurt, our three chefs presented us with a delicious meal that had been locally sourced. Saturday's forecast was for rain all day. Elaine and the guides planned a shorter ride, what was supposed to be the Friday ride, knowing everyone would be wet and cold. Our group headed out Saturday in the rain, and I must say that experiencing Dartmoor in the rain and fog is part of the magic. At some points you could see for quite a distance and other times all you saw was the horse in front of you. Three of us were quite content in the rain, but the rest of the group wanted to head back so we just rode 8 miles or so on Saturday. In the afternoon, Catherine wanted to go to a local tack shop so we drove over to Newton Abbot and went shopping. The rest of the group rested or went to a local pub, where Elaine had a guest speaker come in and speak about the Dartmoor ponies. We woke to the sound of rain on the roves of our yurts, and had a leisurely brunch at 11 AM and then rode out in the afternoon, waiting for the morning rains to finish and the sun to come out. Breakfast was another amazing feast from our caterers. Once in the saddle, we headed into the fields and started climbing to Fice’s well. Anytime we could move at a faster pace we were trotting and cantering, and on Wilma, that often meant galloping. We climbed to the top of the first hill, Newtake, and I took a few photos, it’s hard to explain the incredible and vast amount of space that is Dartmoor. It’s beautiful in every direction, but also different in every direction, and I think that contributes to the awe-inspiring beauty. We climbed Little Mis Tor, and then Great Mis Tor where we took pictures and sipped water bottles. Then we headed down the other side, crossed Shillapark River and a ravine, before having a huge gallop across the peat track and to a stone circle. We all got splattered in mud due to all of the rain, and laughed at each other and ourselves when we stopped at the stone circle. We took a walk break, and headed toward a standing stone and then were off galloping again towards White Tor. We crossed the river at Wealake Farm. 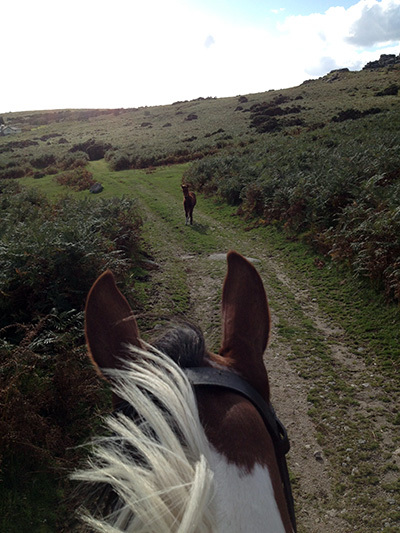 In this stretch, we trotted past a small Dartmoor mare grazing on the side of the trail. Wilma and I were in the lead, and then I heard a very tiny whinny. The foal came trotting up the trail towards us, and her mother that we had just passed, very interested in who we were. The foal was so cute and little compared to the big mare I was on. After we went by the foal scampered down the trail and back to its dam. Spotting a foal between the ears. Photo by Stacey Stearns. We rode on to Cox Tor, barn hill, Feather Tor, Pew Tor, on to Sampford Spinney (a town), and then to Ingra Tor. 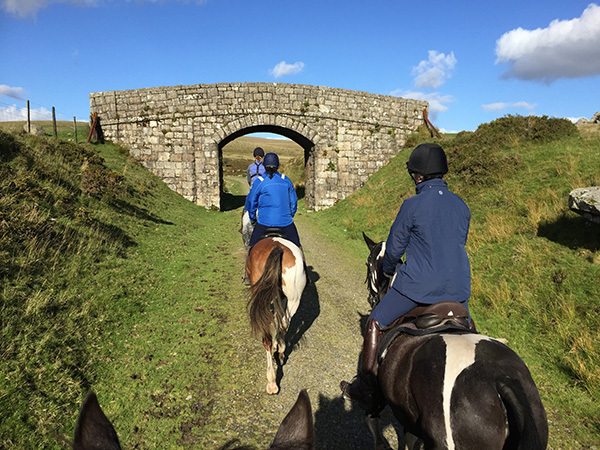 We rode under an old stone railroad bridge at a brisk trot near Ingra Tor, and then it was back to the moorland and off on another canter over to the cycle track. At the cycle track, Wilma saw some hikers and worked very hard to try and overtake them, but we took a left and headed back towards the Foggintor Quarry from Friday. Riding toward the Railroad Bridge. Photo credit Rachel Brock. Rachel found wonderful routes for us all three days. Dartmoor is 368-square miles though – so there are many other sections of the park left to explore another time. Elaine told me that you need five full days of riding to make it all the way around the perimeter of Dartmoor. 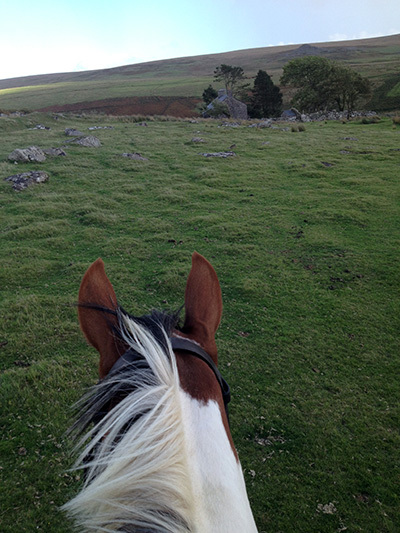 With our base camp in the heart of Dartmoor we were able to ride a different loop each day. Soon the cell phone tower on North Hessary was getting closer, and that meant the end of the Dartmoor Derby. We climbed to the top and looked out over the moors one last time. As we headed down the other side, we scattered a herd of Dartmoor ponies and ducked into another field that looks out over the prison farm and our camp. Back at the barn, the ground crew was waiting to take our horses, and I was sorry to leave Wilma, having grown rather attached over the three days. At our yurts, a campfire was going, and we sat and reflected on our ride as the moon rose and the stars came out. We enjoyed our last dinner together and a night filled with laughter and talking. Then everyone slowly headed back to the yurts to sleep. We had breakfast on Monday morning as everyone slowly departed. All of us from the United States had booked rooms in Bovey Castlefor Monday night, and were transferred over there by the ground crew. The W.H. Smith family built the castle in 1907. I spent the afternoon wandering the grounds taking pictures and visiting the neighboring town of Moretonhampstead, followed by dinner with some of my new friends. The next morning I headed to the airport and flew home. 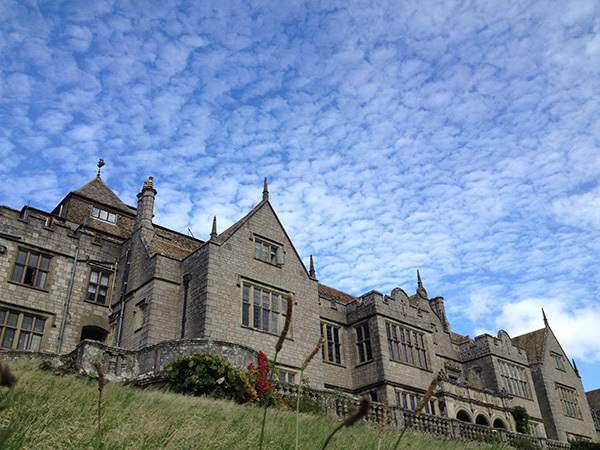 Bovey Castle and blue skies. Photo by Stacey Stearns. Dartmoor enchanted me. I’ve always loved rugged scenery and breathtaking beauty, and Dartmoor is no exception. It draws you in, and captivates the imagination as you wonder what you will encounter over the next tor. 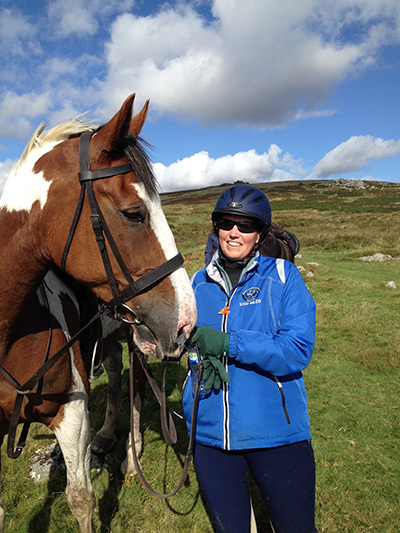 About the Author: Stacey Stearns is a lifelong equestrian from Connecticut. She lives on Mountain Dairy in Mansfield, her family's dairy farm, and enjoys trail riding and endurance with her Morgan horses.